Nanomaterials - substances smaller than 100 nanometers in size - have been added in recent years to an increasing numbers of consumer products used in day-to-day life; in food packaging, medical devices, pharmaceuticals, cosmetics, odor-resistant textiles and household appliances. The extensive application of nanomaterials in a wide range of products for human use poses a potential for toxicity risk to human health and the environment. Such adverse effects of nanomaterials on human health have triggered the development of a new scientific discipline known as “nanotoxicity” – the study of the toxicity of nanomaterials. 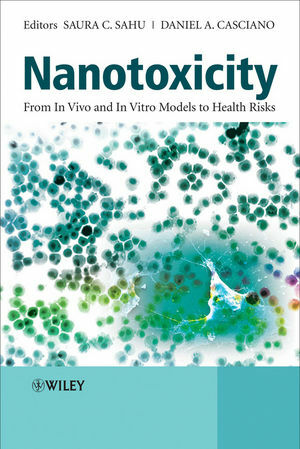 Nanotoxicity: From in vivo and in vitro Models to Health Risks is a valuable authoritative source of information for readers from a wide range of disciplines such as toxicology, pharmacology, drug toxicity and food and environmental sciences. The book will be useful to the research community in academia, industry, hospitals and government, as well as to government regulators and risk assessors of foods, drugs and environmental and agricultural products. Dr. Sahu is the US Editor for the Journal of Applied Toxicology and the editor of Hepatotoxicity (Wiley, Dec 2007), and Toxicogenomics (Wiley, Oct 2008). Professor Casciano was former director of the US Food and Drug Administration's National Center for Toxicological Research in Jefferson, Arkansas, USA. 1 Characterization of Nanomaterials for Toxicological Evaluation (Kevin W. Powers, Maria Palazuelos, Scott C. Brown and Stephen M. Roberts). 2 Criteria and Implementation of Physical and Chemical Characteristics of Nanomaterials for Human Health Effects and Ecological Toxicity Studies (Christie M. Sayes and David B. Warheit). 3 Considerations for the Design of Toxicity Studies of Inhaled Nanomedicines (Lea Ann Dailey). 4 High Aspect Ratio Nanoparticles and the Fibre Pathogenicity Paradigm (Craig A. Poland, Rodger Duffin and Ken Donaldson). 5 Application of Zinc Oxide Quantum Dots in Food Safety (Tony Jin, Dazhi Sun, Howard Zhang and Hung-Jue Sue). 6 Evaluation of Nanotoxicity of Foods and Drugs: Biological Properties of Red Elemental Selenium at Nano Size (Nano-Se) In Vitro and In Vivo (Jinsong Zhang). 7 Evaluation of Toxicity of Nanostructures in Biological Systems (Adam J. Gormley and Hamidreza Ghandehari). 8 Developing Bioassay Methods for Evaluating Pulmonary Hazards from Nanoscale or Fine Quartz/Titanium Dioxide Particulate Materials (David B. Warheit, Kenneth L. Reed and Christie M. Sayes). 9 Nanoparticles: Is Neurotoxicity a Concern? (Jianyong Wang, Wenjun Sun and Syed F. Ali). 10 Hepatotoxic Potential of Nanomaterials (Saura C. Sahu). 11 Nanotoxicity in Blood: Effects of Engineered Nanomaterials on Platelets (Jan Simak). 12 Sources, Fate and Effects of Engineered Nanomaterials in the Aquatic Environment (David S. Barber, Nancy D. Denslow, R. Joseph Griffitt and Christopher J. Martyniuk). 13 Nanotoxicity of Metal Oxide Nanoparticles in Vivo (Weiyue Feng, Bing Wang and Yuliang Zhao). 14 In Vivo Hypersensitive Pulmonary Disease Models for Nanotoxicity (Ken-ichiro Inoue and Hirohisa Takano). 15 In Vivo and In Vitro Models for Nanotoxicology Testing (Rosalba Gornati, Elena Papis, Mario Di Gioacchino, Enrico Sabbioni, Isabella Dalle Donne, Aldo Milzani and Giovanni Bernardini). 16 In Vitro and In Vivo Toxicity Study of Nanoparticles (Jayoung Jeong, Wan-Seob Cho, Seung Hee Kim and Myung-Haing Cho). 17 In Vitro and In Vivo Models for Nanotoxicity Testing (Kyung O. Yu, Laura K. Braydich-Stolle, David M. Mattie, John J. Schlager and Saber M. Hussain). 18 In Vitro Models for Nanotoxicity Testing (Yinfa Ma). 19 In Vitro Human Lung Cell Culture Models to Study the Toxic Potential of Nanoparticles (Fabian Blank, Peter Gehr and Barbara Rothen-Rutishauser). 20 Iron Oxide Magnetic Nanoparticle Nanotoxicity: Incidence and Mechanisms (Thomas R. Pisanic, Sungho Jin and Veronica I. Shubayev). 21 Toxicity Testing and Evaluation of Nanoparticles: Challenges in Risk Assessment (David Y. Lai and Philip G. Sayre). 22 Evaluating Strategies For Risk Assessment of Nanomaterials (Nastassja Lewinski, Huiguang Zhu and Rebekah Drezek). 23 Strategies for Risk Assessment of Nanomaterials (Hae-Seong Yoon, Hyun-Kyung Kim, Dong Deuk Jang and Myung-Haing Cho). 24 Metal Nanoparticle Health Risk Assessment (Mario Di Gioacchino, Nicola Verna, Rosalba Gornati, Enrico Sabbioni and Giovanni Bernardini). 25 Application of Toxicology Studies in Assessing the Health Risks of Nanomaterials in Consumer Products (J.S. Tsuji, F.S. Mowat, S. Donthu and M. Reitman). 26 Safety Assessment of Engineered Nanomaterials in Direct Food Additives and Food Contact Materials (Penelope A. Rice, Kimberly S. Cassidy, Jeremy Mihalov and T. Scott Thurmond).